The Iraqi Election brings surprise…and concern……Maliki didn't win…..
Well, well…..surprise…surprise…in a display that democracy is alive in Iraq…the countries voters have voted to narrowly NOT back its countries currently ruling coalition……. The result of that vote will be that both Allawi and current Prime Minister Nouri al-Maliki will be courting the countries groups to put together enough seats to rule….. But here lies still another uncertainty: If Iraq plunges back into chaos, how will Barack Obama react? The Iraqi Election brings surprise…and concern……Maliki didn’t win….. The Cheerleaders of the 2010 March Madness Teams……. While basketball players remain at the center of March Madness, the stunning ladies on the sidelines keep their team’s motivated and upbeat. The News honors the cheerleaders and their work during the NCAA Tournament. From The New York Daily News…..
My partner Daniel….Is hoping for a windfall in November elections….. He feels that the countries voters will be mad at Obama and Healthcare…..mad enough to vote Republicans into majorities in the House or Senate……. I don’t thing that’s gonna happen…For one…I think the Healthcare Bill is going to be ancient history by November…Number two…the President seems to be holding his own after last weeks good performance…And number three is the emergence of the Tea Party movement….. I keep reminding Daniel about AL Gore and Ralph Nader stealing his best chance to win the Presidency…..
Grassroots support remains vigorous, as evidenced by the thousands of tea-party activists who gathered Saturday in Searchlight, Nev., to protest the health-care law and urge the ouster of Senate Majority Leader Harry Reid. Yet despite thronging primary races across the U.S., true tea-party candidates have stumbled at the polls. In the March 2 Texas primary, 18 incumbent Republican House members faced multiple challengers, including a flock of tea-party faithful. The incumbents won handily, with only one garnering below 60% of the vote. Organizers hope public anger over President Barack Obama’s health-care overhaul will help tea-party candidates who fiercely opposed the plan. Many are now promising to help repeal the law if they win, and are using the bill to try to drum up support from donors. The movement began last year as a backlash against the growth of the government, federal bailouts and the national debt. The next big test comes in May, when 10 states hold primaries, including the tea-party hotbeds of Indiana and Ohio. The Republican establishment is watching to see if tea-party voters fall in line behind the national party’s candidates. Handicappers are predicting heavy Democratic losses in November. Democrats hope the tea-party surge will soften that blow by diluting Republican campaign coffers and pulling mainstream conservatives to the right, imperiling their chances in the general election. 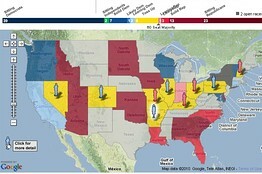 The whole House of Representatives and a third of Senate seats are on the ballot in 2010. See which races are considered closest. “This is great news for us,” says Maryland Rep. Chris Van Hollen, who chairs the Democratic Congressional Campaign Committee. The DCCC has launched a Web site to highlight divisions in the GOP primaries. Student Loan Bill passed with the Healthcare Bill….. I hope we can get some relief thru this new package…. Cause we’re gonna be paying these things for a long…long ….long time…….. Since the bank-based loan program began in 1965, commercial banks like Sallie Mae and Nelnet have received guaranteed federal subsidies to lend money to students, with the government assuming nearly all the risk. Democrats have long denounced the program, saying it fattened the bottom line for banks at the expense of students and taxpayers. “Why are we paying people to lend the government’s money and then the government guarantees the loan and the government takes back the loan?” said Representative George Miller, Democrat of California and chairman of the Education and Labor Committee. Democrats celebrated the legislation, a centerpiece of President Obama’s education agenda, as a far-reaching overhaul of federal financial aid, providing a huge infusion of money to the Pell grant program and offering new help to lower-income graduates in getting out from under crushing student debt. Still, the final bill is less ambitious than the original proposal. Congressional allies of the student-loan industry attacked the overhaul as an overreaching government takeover. The legislation substitutes an expanded direct-lending program by the government for the bank-based program, directing $36 billion over 10 years to Pell grants, for students from low-income families. Even as the Democrats’ decision to attach the student-loan overhaul to the health care package virtually ensured its passage, banks fought fiercely up to the last minute, prompting some lawmakers, like Senator Ben Nelson, Democrat of Nebraska, where Nelnet has its headquarters, to cast their vote against the overall bill. Although private banks will no longer be allowed to make student loans with federal money, many will continue to earn income by servicing those loans. Duke Wins over Baylor!….will be back the Final 4 in the NCAA Mens College Basketball…. The Dog frankly didn’t think they’d get this far…again….. But the Dog is tickled pink to be wrong……YES! ………while this Duke team is hardly among the Blue Devils’ best, it has Krzyzewski back in the Final Four for the 11th time and his first since 2004. He last won a national title in 2001. Nolan Smith had 29 points for Duke and Jon Scheyer added 20 in the South Regional final before 47,492 fans in Reliant Stadium. The Blue Devils will play Saturday against second-seeded West Virginia (31-6) in the national semifinals at Lucas Oil Stadium. “I can’t put it in words,” the Duke senior forward Lance Thomas said. Playing about 185 miles from Baylor’s campus and in front of the former President George Bush, Duke was booed from the moment it stepped on the court. Trailing by 61-60 with 3 minutes 36 seconds left, the Blue Devils tied the score on a free throw by Smith. That started a 12-1 run that Duke used to break the game open and put away feisty Baylor, which had been seeking to advance to its first Final Four since 1950. During the spurt, the Bears took poor shots and lacked discipline, the latter of which is a frequent criticism of their coach, Scott Drew, who appeared to be outcoached by Krzyzewski. Trailing by 3 at halftime, Duke tied the game at 35-35 on the first possession of the second half on a 3-pointer by Scheyer. Baylor then surged to a 5-point lead before the Blue Devils used an 8-2 run to reclaim the lead at 45-44 on a pair of free throws by Smith with 16:15 left. 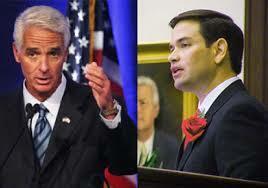 Charlie Crist will stay in the Race in Florida for the Senate…….. The Dog has cautioned Daniel several times that Crist would not make any political moves despite bad poll numbers until he finished debating his GOP opponent Marco Rubio…..
Florida Gov. Charlie Crist and former Florida House Speaker Marco Rubio debated Sunday morning on Fox, where the two Senate hopefuls sparred over everything from the stimulus to the price of Rubio’s haircuts. Crist also confirmed that, despite Rubio leading the governor by double digits in the Republican Senate primary race (an average of 25.4 points in March, according to Real Clear Politics data), he would be running as a Republican and not entering the race as an independent. And if elected, he said, he would not ditch the office to run for the Oval Office in 2012. Crist also defended his acceptance of stimulus funds, and said as a senator he would have voted for the $787 billion package. “Things have started to stabilize now and they’re getting better in Florida,” he added. Rubio contended that record 12.2 percent unemployment in the state showed otherwise. “If it’s bad for America it couldn’t possibly be good for your state,” he said. Links to the debate……Here…..…..and Here…..…. 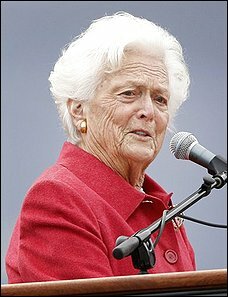 Barbara Bush hospitalized in Texas…..
HOUSTON — Former first lady Barbara Bush remains hospitalized in Houston, where she’s undergoing what a family spokeswoman describes as routine tests. Spokeswoman Jean Becker said Sunday that Bush has not been diagnosed with anything and doctors aren’t looking for anything specific. Mrs. Bush underwent heart surgery in March 2009, for a severe narrowing of the main heart valve. She also was hospitalized in November 2008, when she underwent surgery perforated ulcer.